Mouth guard – a protective device made of plastic that is used in martial arts and other contact sports to prevent injury to teeth and oral cavity. In Amateur competitions in various types of martial arts mouth guard is a mandatory attribute of the equipment of the athlete. The use of mouth guards during competitions and training is a must in Boxing, combat Sambo, American football and ice hockey on grass, Taekwondo, mixed martial arts and lacrosse. The cap fits over the teeth of the athlete and protects them from injury and deposition as a result of blows to the head. The cap also protects your lips and inside of the cheeks from accidental prokusyvanie, breaks and bruises, and gums from bleeding. The cap may protect the athlete from more serious injuries: a concussion, loss of consciousness, bleeding into the brain, fractures of the jaw, neck injuries. Typically, novice athletes (boxers) starts to use a mouth guard only after losing one or two teeth, as from time to time hoping for good luck. Dentists in recent times seeing an increase in cases of injuries of the jaws, teeth and mouth as a result of lessons extreme sports and martial arts. This can be avoided when using the Capa. Standard Capa – budget option for the novice athlete. Can be produced from both conventional and thermoplastic plastic. 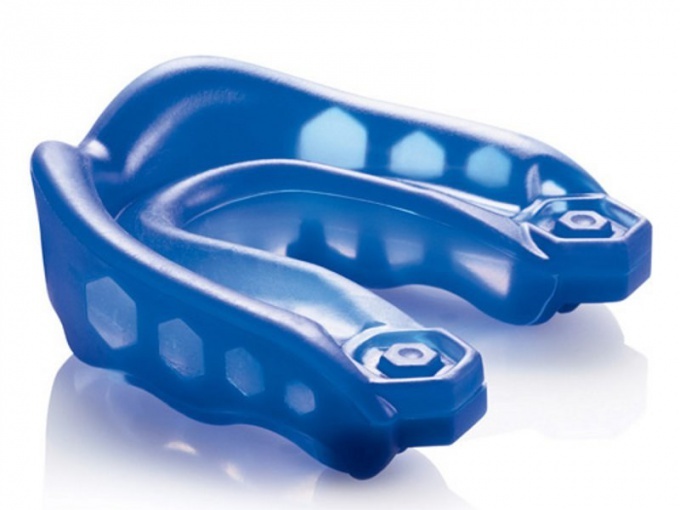 Standard molded mouth guard too thin in the mouth and provide only minimal protection for the mouth and teeth. Often have an unpleasant taste and smell. Their only advantage – low price. Customized mouth guards made by dentists on the dental cast of the athlete using the latest materials and technologies, making them extremely expensive. For the money the athlete receives the highest protection and wearing comfort. Many sports doctors and dentists recommend using a mouth guard when Cycling, skating, mountainbike, snowboarding, skiing, skateboarding. In addition, the cap can be on one jaw and two from one and a half layers of material, two and three with a reinforcing tab. The tray on the two jaws are more comfortable to wear: the teeth are correctly positioned, comfortable to talk, drink water, they almost hinder breathing. Sandwich trays with reinforcing inserts provide maximum to date protection. A mouth guard with special tread facilitate breathing athlete and create additional protection from impact.